Moving is not only a stressful experience for the two legged members of the family but pets can be extremely stressed and confused as well. Also there are many things you will need to keep updated for safety reasons. As veteran Orange County Residential Movers we have seen many families stressed at the last minute about their pets and would like to offer our advice! Take a look at our tips for moving with your pets. 1. Prepare your new home - Remember to prepare your new home for your furry friend. They will most likely be confused and stressed so be sure to make things as consistent as you can with your previous residence. Get their water out, bed, crate, familiar toys etc. Also make sure there aren’t any hazards such as a hole in a fence or inside the house that your frightened pet may get out/stuck in. 2. Keep your pet separate: While the moving and packing is happening it is best to keep your animal away from it. This chaos will most likely frighten your pet even further. Try and keep them in the yard or a secluded room. If you have the option to keep them at day care that might even be better. 3. Update tags- We can’t stress enough – update your animal’s tags and microchip. This is so extremely important. If your animal does happen to get out you want to make sure they are able to be brought back to you safely. You don’t want them ending up at a pound with no one knowing where they came from! This is common so be sure to make the tags ahead of time. 4. Find a new Vet- Make sure to find a new veterinarian before moving to the new location. You can do your research online with places like Angies List. You will want to make sure to bring your old vet records and have prescribed meds on hand. Hopefully these tips will help make you and your furry family member more comfortable during your move. Pets are part of the family and it is our job to treat them that way! 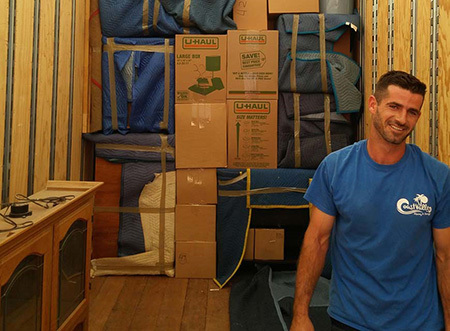 Coast Valley Moving and Storage is the premier Orange County moving company and works hard to make sure their customers arrive to their new destination happy! Call them today for your free quote.